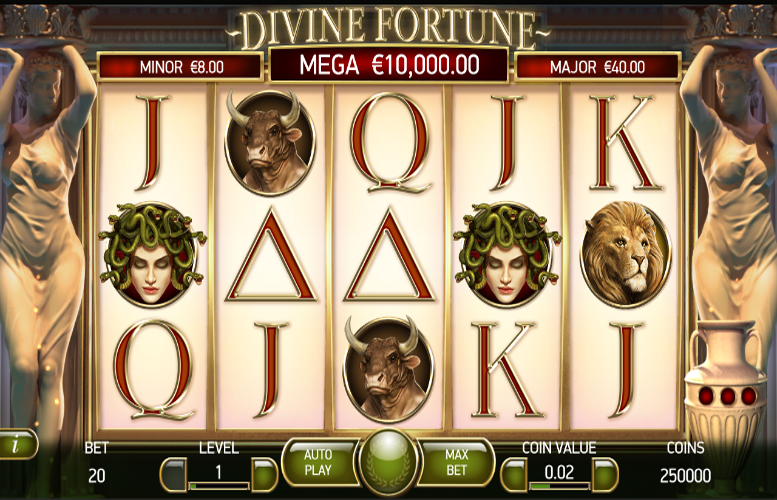 On the Divine Fortune slot machine, we take a trip through the tales of the myths and legends of Ancient Greece. The game pays homage to some of the most popular stories from the classical mythology of the civilisation. It’s a beautifully stylised offering that’s played over five reels and three rows of symbols. Players must match symbols on this grid along one of the 20 fixed win lines. 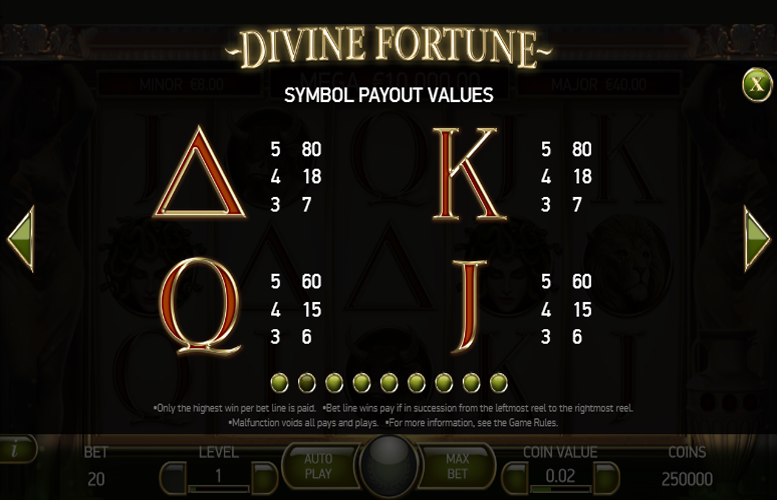 There are a great number of exciting gameplay features on offer in Divine Fortune too. These keep the action varied and allow for a lot of enjoyment, even on subsequent visits. Creative theme. We’ve not seen many slots that draw on classic mythology as their inspiration. Progressive jackpot! What’s not to like about being able to win lifechanging sums off money off a single spin. Loads of bonus features. NetEnt have treated players to an eclectic selection of side games and features. This keeps gameplay varied. The lowish upper betting limit may put some of the highest rollers off Divine Fortune. At £100 per spin, it’s not bad. However, those with the biggest rolls might find it restrictive. Medusa = 600x the line bet. Lion = 400x the line bet. Minotaur = 300x the line bet. Griffin = 200 x the line bet. After a Pegasus “wild” symbol lands on the reels and all winnings are paid for the spin, each “wild” symbol will shift down a single position on the reels. Following this, a Falling “Wilds” Re-Spin is awarded. This can occur in both the main game and Free Spins mode. “Wild” symbols continue to activate Falling “Wilds” Re-Spins until they disappear from the reels. A Falling “Wilds” Re-Spin is still awarded on the round when the last “wild” symbol falls off the reels on the bottom row. 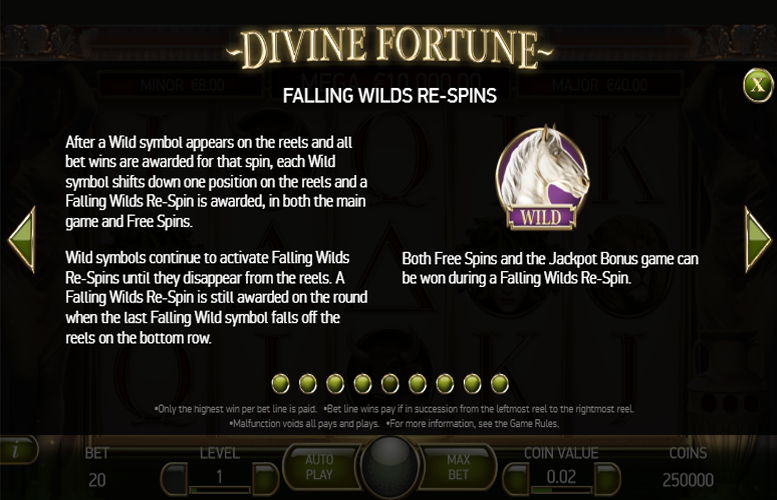 What’s more, both Free Spins and the Jackpot Bonus game can be won during a Falling Wilds Re-Spin. The “Wild” on “Wild” feature is activated when a “wild” symbol lands behind a Falling “Wild”. This can occur during both the Free Spins mode, as well as the main game. When the “Wild” on “Wild” feature is activated, the affected “wild” symbol expands to cover the whole reel before winnings are awarded for that spin. Each “wild” symbol shifts down one position on the reels and a Falling “Wilds” Re-Spin is awarded with two Falling “Wilds” on the reel. Landing three or more “Free Spins” symbols anywhere on the reels during the main game will activate the Free Spins mode. This can also occur during Falling “Wilds” Re-Spins. During the Free Spins mode, any “wild” symbol landing on the reels will become a “Wild” on “Wild”. This will then expand automatically to cover the whole reel. Three Free Spins symbols = Five Free Spins. Four Free Spins symbols = Eight Free Spins. 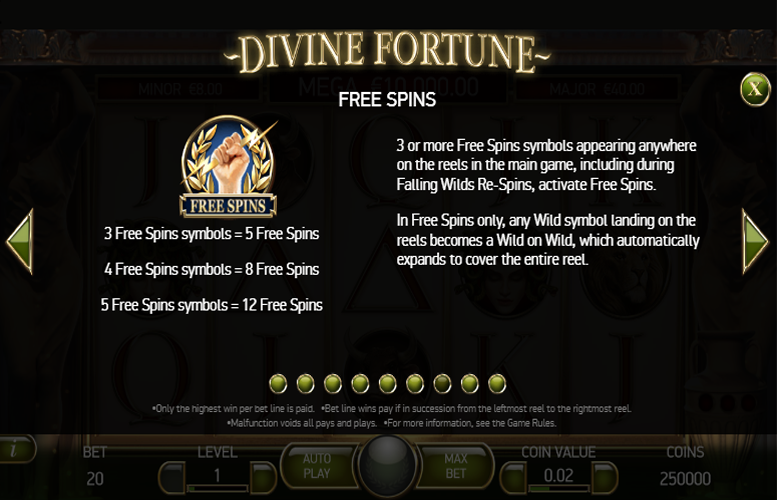 Five Free Spins symbols = Twelve Free Spins. Players will activate the Jackpot Bonus game when they collect three or more “Bonus” symbols during the main game only. Before the Jackpot Bonus game starts, the collected “Bonus” symbols are placed on the reels in random positions. Each “Bonus” symbol has a random coin win value of between 10 and 200x the bet level. One row of “Bonus” symbols = Minor Jackpot. Two rows of “Bonus” Symbols = Major Jackpot. Three rows of “Bonus” symbols = Mega Jackpot. Players should note that the chance to win the progressive “Mega Jackpot” increases with the size of bets. In addition, all spins within the Jackpot Bonus game are free! Ace or King = 80x the line bet. Queen or Jack = 60x the line bet. The number of win lines on Divine Fortune is fixed at 20. This means that players are only able to adjust the number of coins bet on each line, as well as the value of each of these. The maximum and minimum number of coins that can be bet per line are 10 and one respectively. Meanwhile, each coin can be worth between 1p and 50p. This means, when all values are set to their minimum, the lowest possible bet per spin is just 20p. Likewise, when everything is maxed out, the largest possible bet per spin is £100. Whilst this is likely to satisfy many players, the highest rollers around may find it a little restrictive. 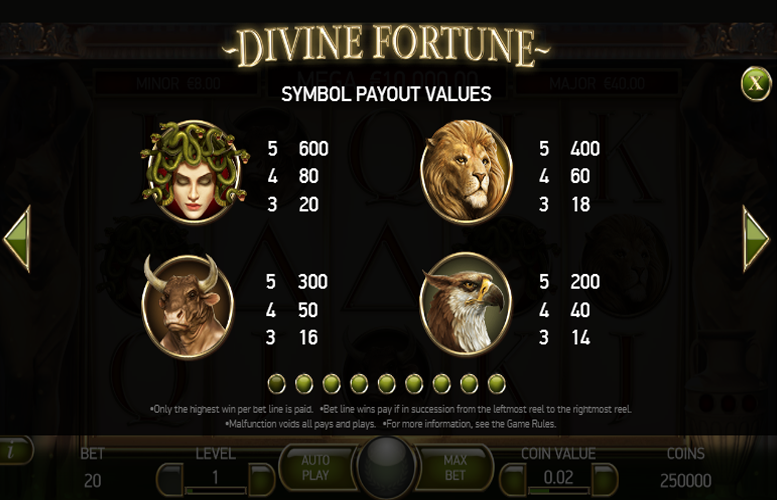 The Divine Fortune slot machine from NetEnt is a great example of how creative a solid team of developers can get with their slots these days. The number of bonus features, the art style and subject matter being so complementary, and the opportunity to drop a sizeable progressive jackpot all make it well worthy of a few spins. If the upper betting limit was a little higher, Divine Fortune may have received a rare perfect score from us! This game has a rating of 5 / 5 with 716 total reviews by the users.